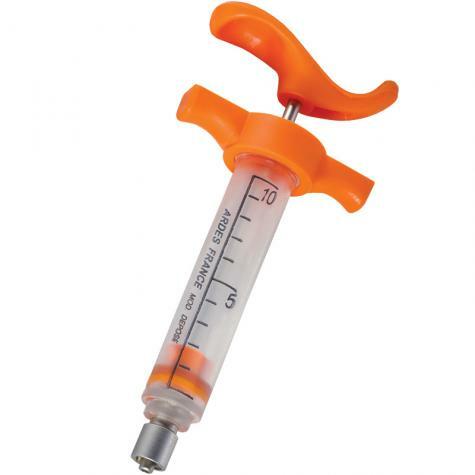 Use this strong, durable syringe for vaccinating animals. It offers a more secure grip than the disposable units. Should last for years. Stainless steel connection. Top screw to enable complete breakdown for disinfecting. Use needles with luerlock hubs. Disinfect after each use. For livestock use only. I was somewhat upset that I have not been able to use the syringe as there is NOTHING to attach. I purposely bought this JUST IN CASE our baby goat (who had not been born yet) could not get milk from his mother. Online was the only option as there wasn't a store that actually sold these near us. It should have come with SOMETHING to use. Fortunately, everything worked out, but I will still need attachments for this later. I would not recommend this product "as is", but plan on spending the additional money for needles/drencher. Love it !! Easy to handle. I can get into those little spaces behind the elbow, even when my sheep decides to lay low.